In the sandwich generation your life continues to get complicated. 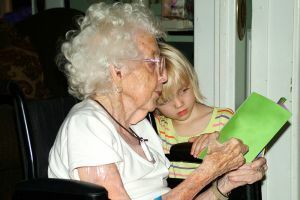 You have to deal with aging parents, but you also have to deal with your children's issues and confusion about what's happening to their grandparents. How do you explain the facts of aging to your children? If your parents are becoming more frail, or develop a disability, how will your children make sense of all this? If you leave the kids for a visit with your parents, but your aging parents no longer have the energy or staminia they once did, how do you help make the situation work? Consider these ideas for celebrating National Grandparents Day. Many families will transition to multi-generational households. What are the new rules and arrangements that will make this understandable for children? How can you ease their adjustment to all the changes in this sandwich generation home? For some, illness or disease will radically change your parents moods and behaviors. This can be very frightening for children if Grandpa no longer recognizes them or doesn't remember their name. There are some wonderful resources, including an HBO film that can help you learn to talk about alzheimer's symptoms with your kids. You'll need to be prepared to answer their questions in a way that gives them skills and resources to cope. You still have that perfect holiday fantasy in your mind. Time to get over it before you drive yourself crazy. Try these new tips for coping with holiday stress. When you are stressed and overwhelmed with all you have to do, would you be surprised that the first sources of family caregiver support is YOU. At some point your children will finally have to encounter your parent's death. There are ways to set the stage so the transition is not so scary. In addition to everything else, you will also be responsible to help them through their time of grief. Being prepared for the unevenness and unpredictability of your children's grief will help both of you. You can turn to books and other resources to help you give your kids a safe space to process their own feelings and emotions of grief. Children's grief is very real, but they process their feelings very differently than adults.